Bournemouth secured their highest top-flight finish with a draw at Leicester on the final day of the 2016-17 Premier League season. 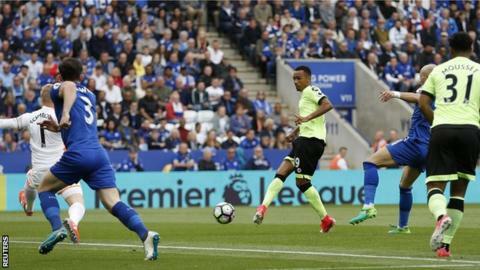 Junior Stanislas put the Cherries ahead after just 59 seconds, smashing in a rebound from Ryan Fraser's shot at the end of Lys Mousset's driving run. Leicester started poorly but were transformed after the break and Jamie Vardy poked in Islam Slimani's knockdown early in the second half. Vardy had a goal incorrectly ruled out for offside nine minutes later as he stabbed in after Slimani's blocked shot, while Slimani headed badly wide when found in space by a Riyad Mahrez free-kick with five minutes to play. The Cherries - who finished 16th in their first Premier League campaign last year - end the season in ninth, while 2015-16 champions Leicester move down to 12th. When Leicester were presented with the Premier League trophy in May last year, Claudio Ranieri told the Leicester fans: "Keep dreaming, why wake up?" After the Italian was sacked as manager in February with the club one point above the relegation zone, he said his "dream died". Craig Shakespeare was widely welcomed as he came in to steady the ship, and he won his first six games in charge. The Foxes rallied to eventual defeat by Atletico Madrid in the Champions League quarter-finals and mid-table safety on the domestic front - but will Sunday's match turn out to be Shakespeare's last? It was a sluggish showing that only belatedly sparked into life. Coupled with Thursday's 6-1 thrashing by Spurs, the season's end will have done little to help his cause with the club's owners. Meanwhile, Bournemouth fans will be reflecting on another year spent exceeding expectations. In just their second season in England's top flight, Eddie Howe's entertaining and enterprising side scored more than 13 of their Premier League rivals - only the top five and seventh-placed Everton scored more. There was a 4-3 win over Liverpool, a hugely entertaining 3-3 draw with Arsenal, and a dramatic 6-3 defeat by the Toffees on the way. Joshua King - left out of the squad at Leicester because of an ankle injury - top scored with 16 goals, while the ninth-place finish will pocket the club £22.8m in prize money. Will the Cherries improve once again next season? Leicester's 12th place will earn them £17.1m in Premier League prize money, but had Vardy's goal counted - or Slimani not headed horribly wide - they might well have taken almost £6m more. Victory over Bournemouth would have seen them climb above the south coast club and into ninth themselves, pocketing an extra £5.7m. Leicester finished on 44 points, the lowest total of a reigning English top-flight champion since Liverpool in 1902 (42 points). Bournemouth won 46 points, four more than they recorded last season. After winning his first five Premier League games in charge, Leicester boss Craig Shakespeare guided his side to just two victories the final eight matches. Vardy scored eight goals in 13 Premier League games under Shakespeare, compared with five in 22 under Ranieri this season. Bournemouth midfielder Gosling was strong in the tackle, tidy in his passing and was unlucky not to score. His stinging first-half drive was tipped brilliantly over by Kasper Schmeichel. Leicester boss Craig Shakespeare: "For the benefit of everybody it'll be sooner rather than later. "When I get the phone call, then I'll know. I don't know when that'll be. It's out of my hands. There is no set date, it was just said until the end of the season. "The owners are very good business people and I'm sure they appreciate you, me and everybody is waiting and I'm sure we'll get a decision soon." Bournemouth boss Eddie Howe: "What is next? We'll wait and see. I feel there is a lot of improvement to come. "There will be a long summer where recruitment of course will be important, but at the minute let's enjoy what the players have achieved this season and give them plenty of credit. "I think we've become more streetwise to the Premier League. It's a challenge for us to improve." Match ends, Leicester City 1, Bournemouth 1. Second Half ends, Leicester City 1, Bournemouth 1. Offside, Leicester City. Demarai Gray tries a through ball, but Islam Slimani is caught offside. Attempt missed. Islam Slimani (Leicester City) header from the left side of the six yard box is close, but misses to the right. Assisted by Riyad Mahrez with a cross following a set piece situation. Riyad Mahrez (Leicester City) is shown the yellow card for a bad foul. Corner, Leicester City. Conceded by Adam Smith. Attempt blocked. Ben Chilwell (Leicester City) left footed shot from the centre of the box is blocked. Offside, Bournemouth. Dan Gosling tries a through ball, but Benik Afobe is caught offside. Corner, Leicester City. Conceded by Simon Francis. Attempt missed. Wilfred Ndidi (Leicester City) left footed shot from outside the box is close, but misses to the right. Assisted by Daniel Amartey. Substitution, Bournemouth. Matt Worthington replaces Ryan Fraser because of an injury. Corner, Leicester City. Conceded by Andrew Surman. Attempt saved. Jamie Vardy (Leicester City) header from the centre of the box is saved in the top right corner. Assisted by Riyad Mahrez. Attempt missed. Riyad Mahrez (Leicester City) left footed shot from the right side of the box misses to the left. Assisted by Marc Albrighton with a cross. Attempt missed. Islam Slimani (Leicester City) right footed shot from the centre of the box is close, but misses to the right. Assisted by Danny Simpson with a cross following a set piece situation.